Added Infrared sensor and IR led to the IR presenter / laser pointer. MARK - Print a star to the output as marker. 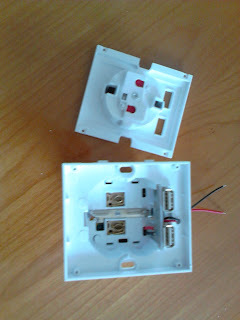 Finally i removed the module from my project and replaced it with another module. The project worked as expected! I tested the 'bad' module and it turned out that GPIO4 and GPIO4 on this module could not be used for input signal any more. Using GPIO4 and GPIO5 for output was no problem. 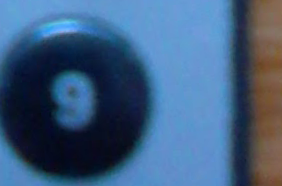 When connecting the pin (with a button) to ground the little red leds show if if the pin is connected to ground. 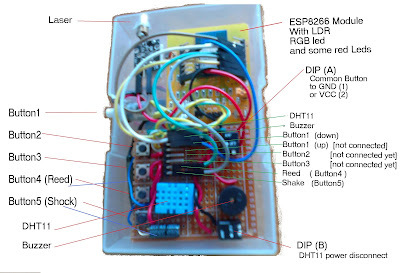 The input signal read by the ESP8266Basic program is always 0. 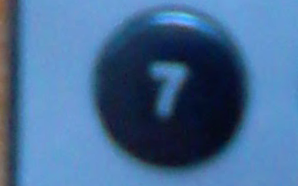 On a similar 'good' module GPIO4 and GPIO5 are 1 if not connected and 0 if connected to ground. Don't know is if the input circuit is destroyed during the life of this module or this is a software issue. Plan with this module is to use in in another project where GPIO4 and GPIO5 are used as output. 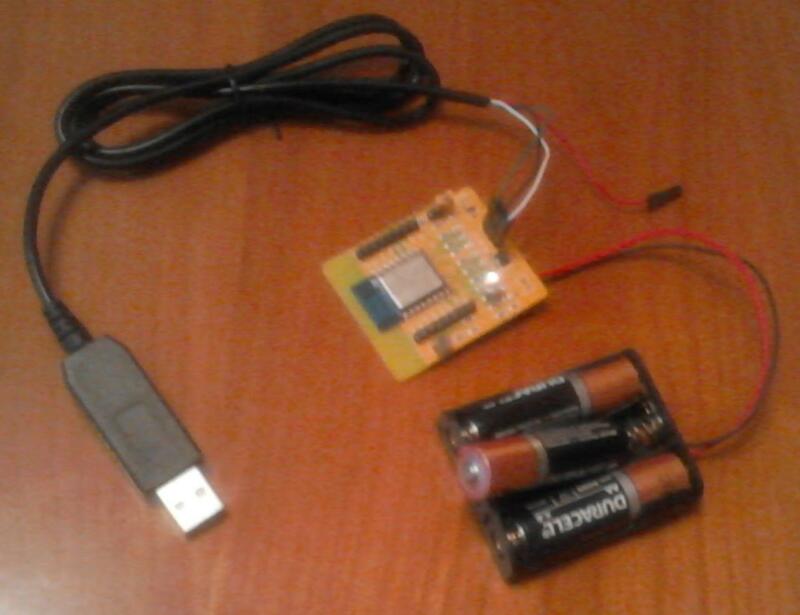 Hacking a USB power socket. 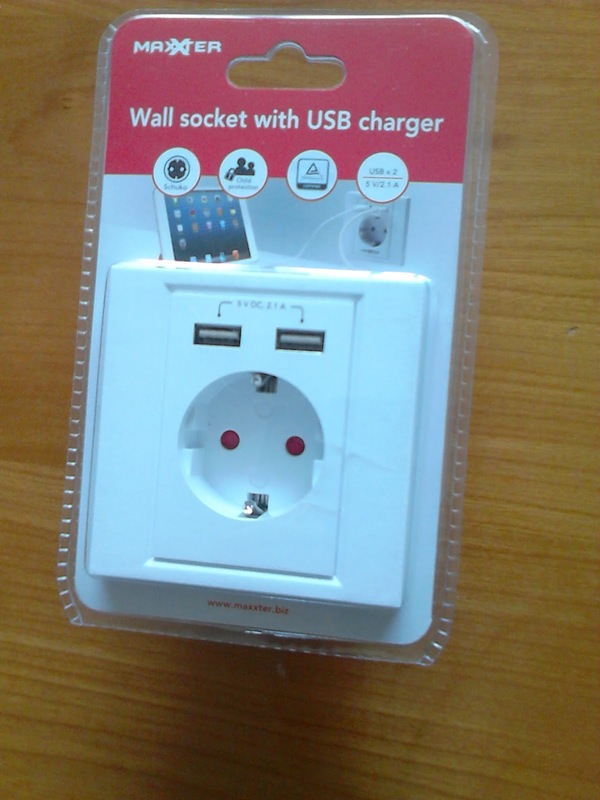 For less than 7 euro's i bought this power socket with 220V and USB (inbouw stopcontact met USB aansluiting) at the Action in Almere (The Netherlands). 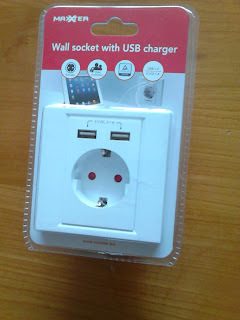 It is always nice to have USB power ( e.g. for home automation projects) and i also wanted to know if it is easy to modify the circuit to control the 220V socket with a relay. As i already expected these is not much space to interrupt the 220 Volt power circuit safe. This to add a relay for controlling the main power. Finally i decided only to add two wires, and make a hole to tap the (low voltage) USB power and bringing it to back of the wall socket for powering a (hidden) IOT device. 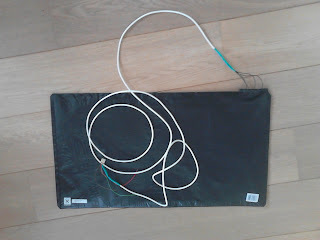 Today a picture of an alarm step mat (Conrad 751913 bought some years ago) with, recently added, a long wire and a connector. The floor mat is somewhere under a carpet in my house. The connector is plugged in a ESP8266 module. This is not a detailed project, only for inspiration and a message to inform you that my carpet is upgraded to an IOT device. 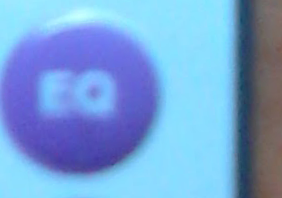 received on ESP8266 with ESP8266 Basic. 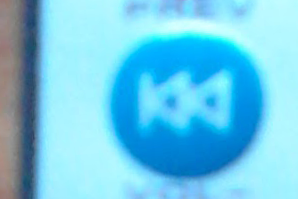 This is a picture of the laser pointer / presenter. 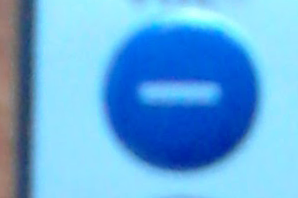 I only added one button at the outside of the box. 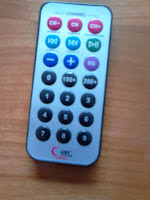 With more buttons the presenter perhaps could be more easy controlled. 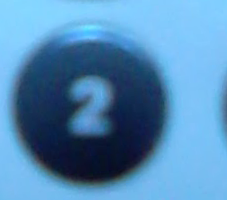 With only one button you can send different triggers to a program by pressing the button for a long or a short time. The box is transparent. 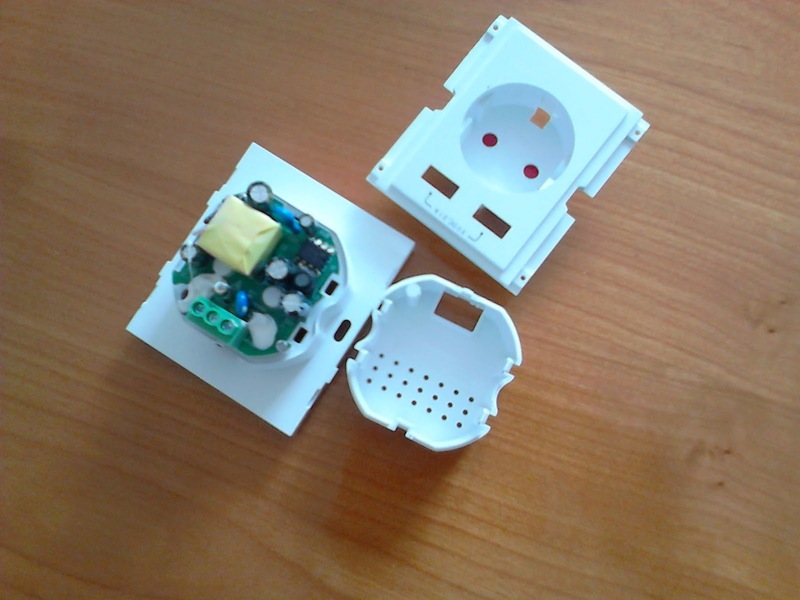 With this transparent box you can still use the RGB led and the LDR on ESP8266 module. - The Light Detecting Resistor is currently inside the box. I have plans to move the LDR to the outside (on front of the box) for better sensibility. 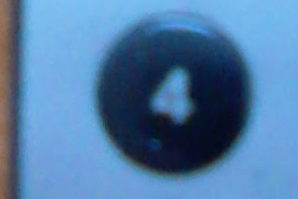 - A second reed contact ??? 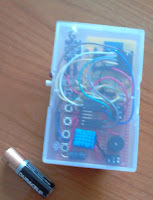 In this third article about my DIY IOT laser pointer / presenter programming examples/programming ideas to use this presenter / laser pointer. 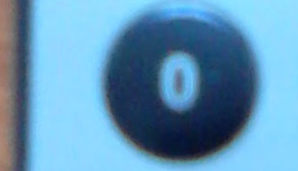 A simple program to switch the laser on with Button1. This program gives a simple webpage to control the laser. 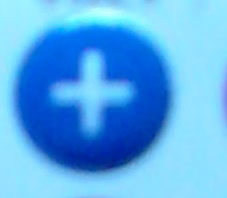 With the buttons [On] and [Off] you can switch the laser On or Off with the web interface. 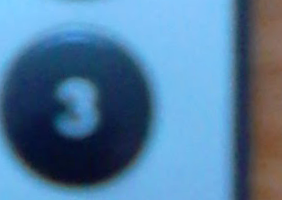 The three buttons [Button1], [Reed] or [Shake] are to select other input to control the laser. This blog article describes how i hardware configured my laser pointer / presenter.
' 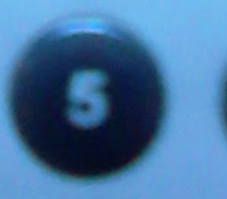 The "other side" of the Button1-5 connected to GND with DIP Switches (A) (1). There are two red VCC female dupont cables one needs to be connected to VCC on the ESP8266 board. The laser module needs to be connected to the other red VCC female dupont cable. 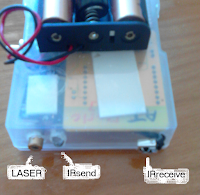 The other side of the laser module is directly connected to the ESP8266 module. 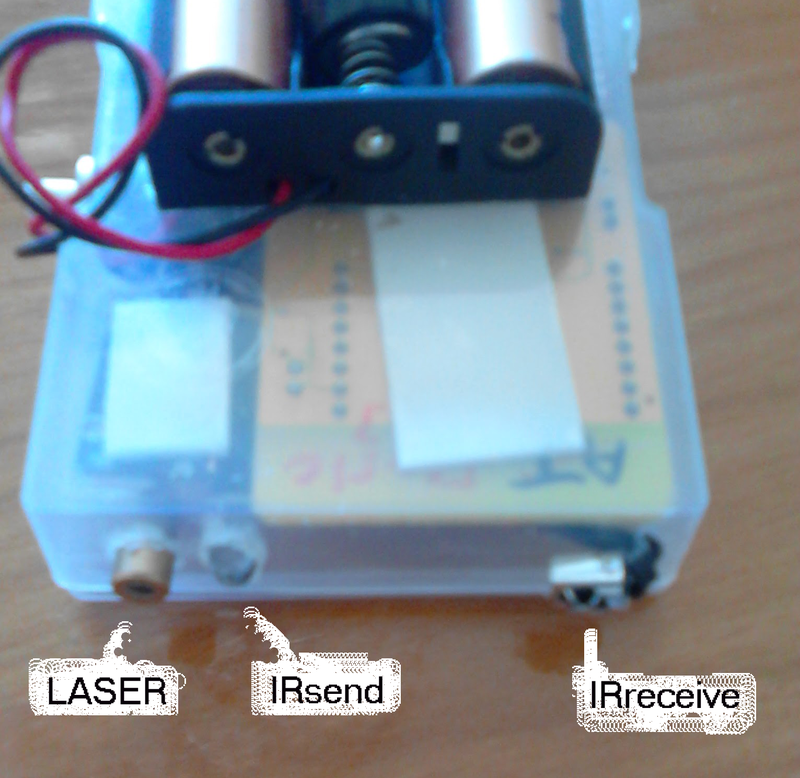 I used KY-nnn laser modules ( 37in1 arduino module kit ) . 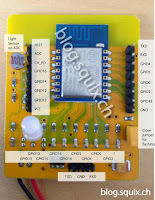 As some of these modules are wired reverse you need to check yourself if you need to connect S to VCC or to a GPIO line of the ESP8266. 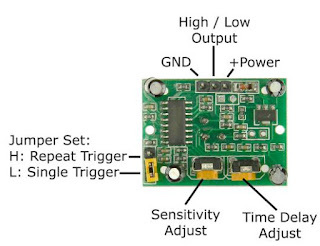 The ESP8266 module has the following connections. This week i will dedicate some blog posts to a presenter / laser pointer that i made. 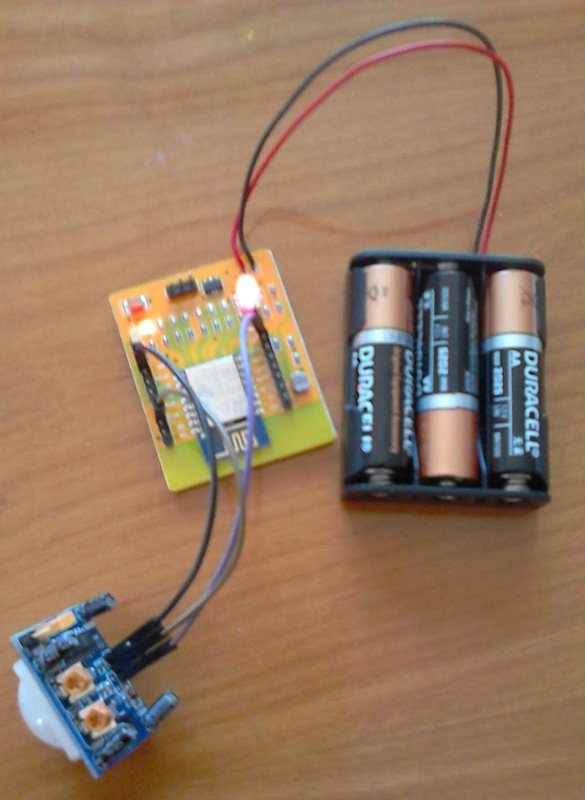 With a laser led module and a battery you can easy make a simple own laser pointer. 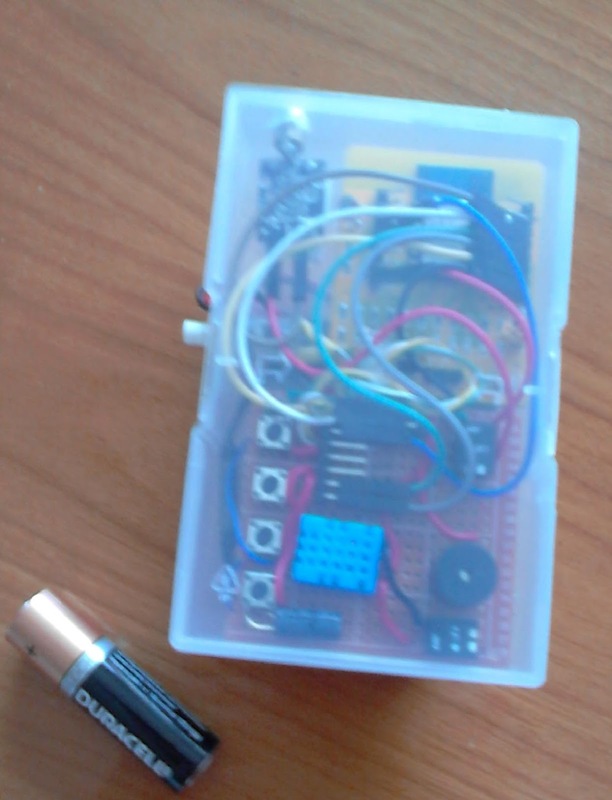 To make it a real IOT laser pointer / presenter i added a ESP8266 module, a button and as a bonus some other spare parts. bought in an hardware store that i wanted to give a second life. my ESP8266 module on the back of the box. 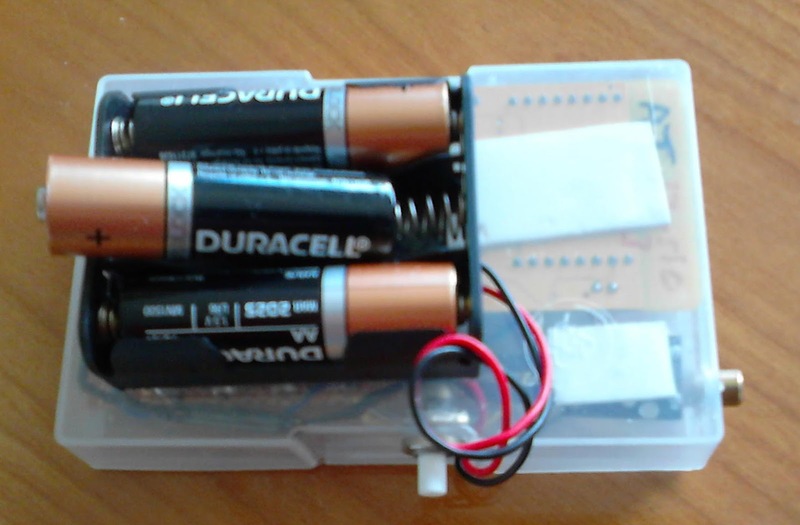 a opening to for the wires of the battery. I added a little PCB for some other components. For the power i added two dupont wires with female connectors to connect to the ESP8266 unit. One additional dupont wire with female connectors is added for the Laser led. 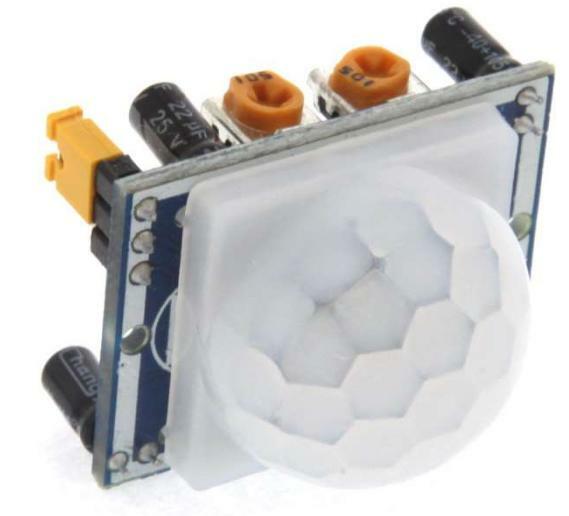 The other side of the Laser led is connected directly to the ESP8266 module. 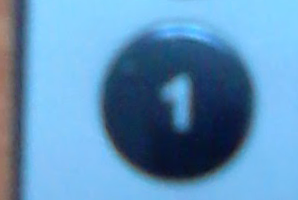 For this version i wanted only one pushbutton on the outside of the box. 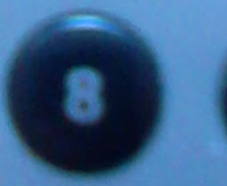 ( Button1 ). 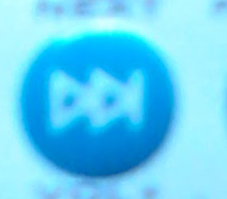 As the button that i had in stock had 3 connections ( push and notPushed and common). I connected pushed and notPushed to a jumper, so perhaps i can use his later on. 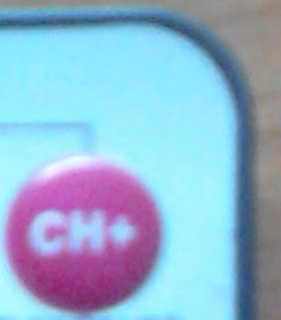 from this button i also connected one side to the jumper. The other (common) side of the buttons i all connected to a DIL switch with two switches. Using this switch i can connect this common side of all switched to VCC ( 3.3.V) or all to ground. For a simple version you can also skip this dip switch and connect the common to ground. 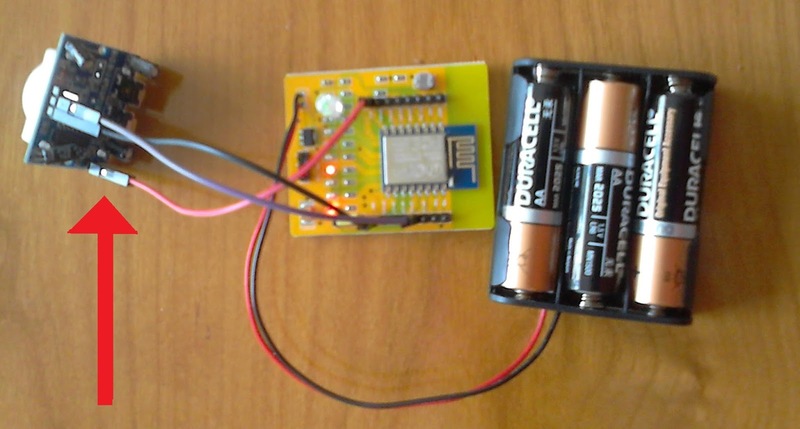 (If using a similar ESP8266 module). Parallel to Button5 i added a switch vibration / tilt switch / shaking ball switch to detect if the module is moved. Parallel to Button4 i added a reed contact switch. 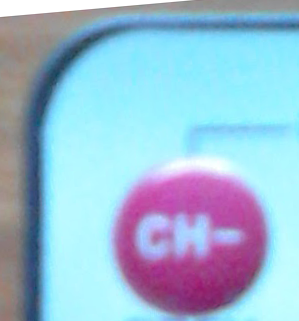 With this switch you can detect a magnet. 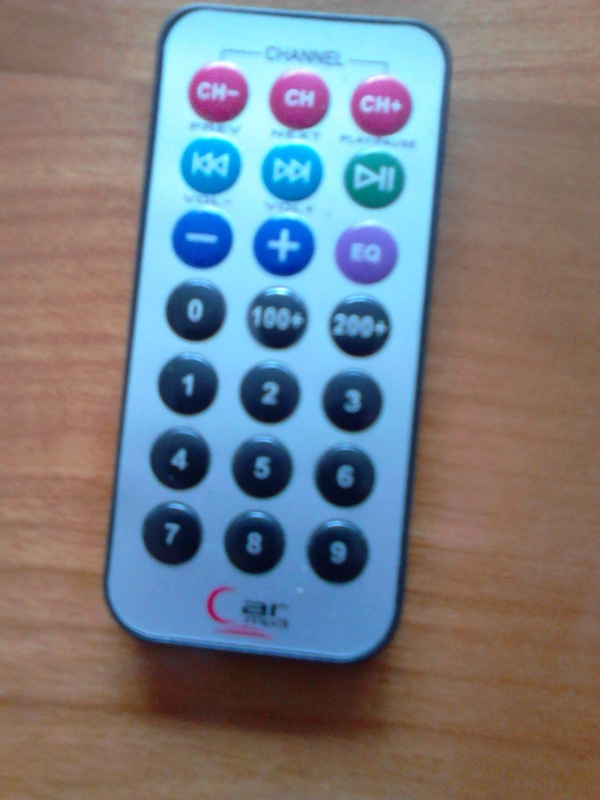 A reed switch is not needed for a presenter / laser pointer but i had one in stock it is a cheap add-on feature. I added a passive buzzer connected to GND and a jumper. 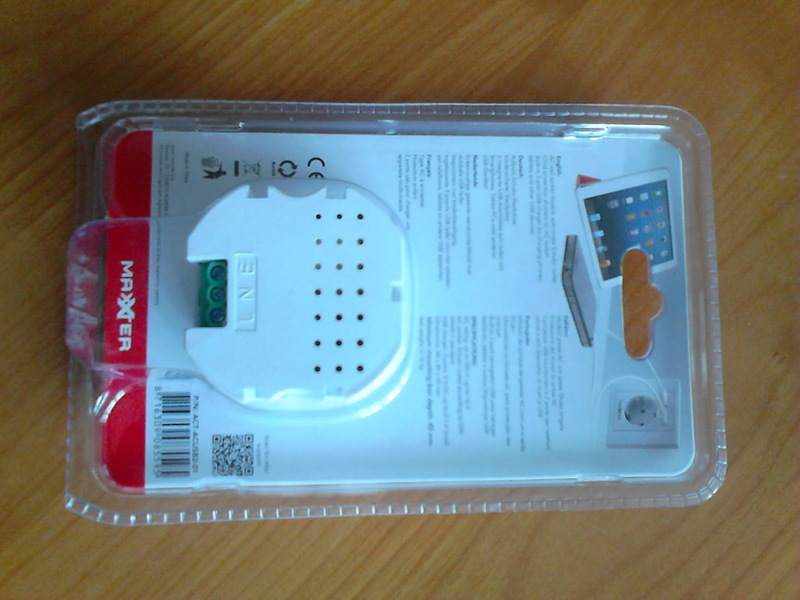 In stock i also have some DHT11 temperature humidity sensors. They are not expensive so i decided to add one also with a DIL switch to disconnect the DHT11 from the power lines for a "hardware low power mode". (In that case you can not read temperature and humidity!) 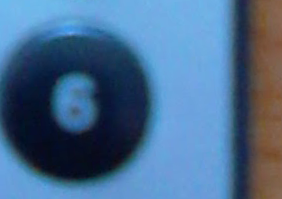 The signal line of the DHT11 sensor is also connected to a jumper. 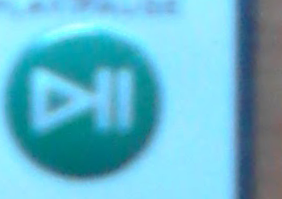 The power On / Off switch is deliberate missing. 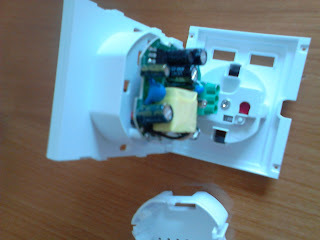 To turn the power off remove the batteries. This prevents accidentally turning of the device and keeping the batteries in a not used device for long time. On an earlier blog i posted an article about the ESP8266 and a 5 Volt PIR sensor. 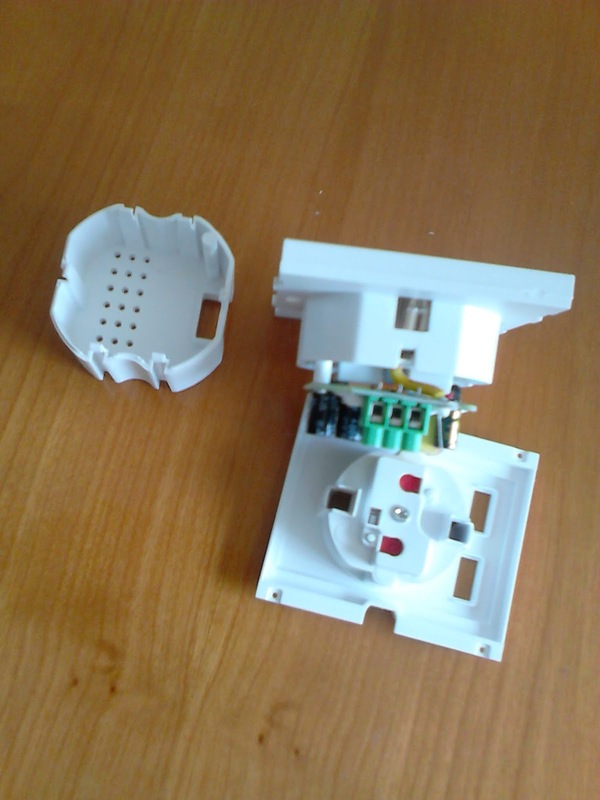 PIR sensor is power by 5V, but if we look at schematic we will see that is's 3.3V internally. Because ESP8266 is 3.3V, we can bypass PIR internal regulator. 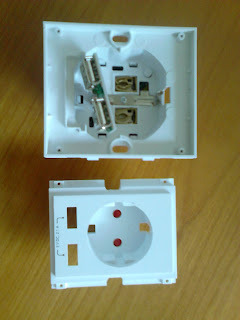 Connection after regulator is available at JP1 pin 3. In our case we will connect 3.3V power supply to this point and not to 5V power supply. 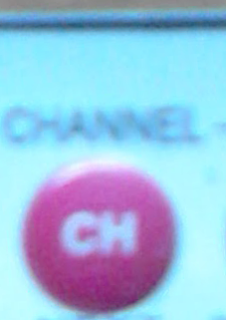 See the picture below for my test and yes it will work if the you connect VCC (3.3V) to JP1 pin 3! 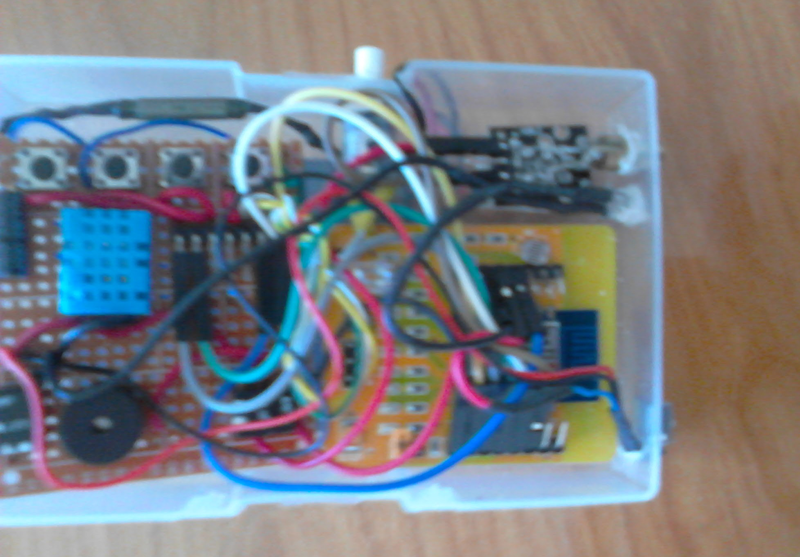 Today a small ESP8266 Basic program to use a Buzzer with the ESP8266 module. to publish next week on this blog. a ESP8266 and this program will run on it. 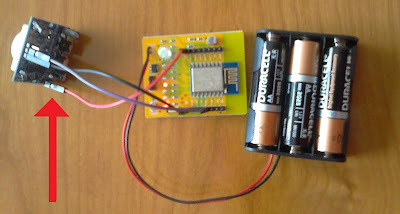 As i have some of these PIR motion detecting sensors and i wanted to know if my (5 - 20 volt) sensor does work with ESP8266 test module. The spoiler of the story is already in the title. With the signal to PinPir (I tried several pins), GND and +Power to VCC ( 3.3 Volts) i tested the ESP8266 with the program below. 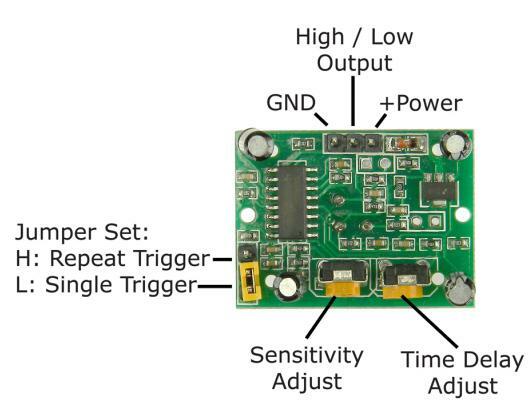 This program also toggles another led ( PinChk ) every time the timer routine tests PinPIR. 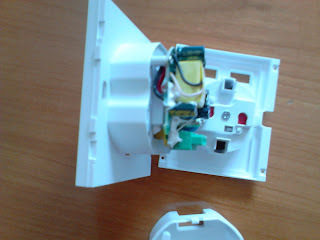 First the PIR sensor seemed to react on movements.The PIR sensor has a jumper for Single or Repeat Trigger and adjustments for Sensitivity and Time delay. 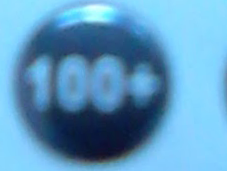 I did not want false alarm signals so did more tests. 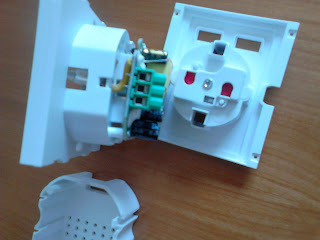 My conclusion is this PIR module does not work reliable on 3V3 if connected the standard way ! 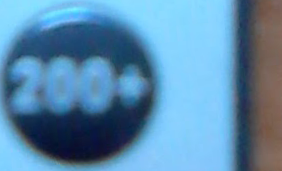 This is not a big surprise, the specs say you need 5 - 20 Volts! This configuration starts to give false signals after some time especially if you use the (more power consuming) RGB leds and afer a time you can even remove the PIR sensor and get almost the same results as without the PIR sensor. A negative result is also a result, i decided to publish it for you (and as a reminder for myself). Perhaps a part of the problem is the wiring of my ESP test module, but 3.3 Volt is also below the specs of this PIR module ! But this is not the end of the story. I did a search on the internet (i need a PIR sensor for my project) and found an interesting article about my module... As i have planned some other things you have to be patient before i can publish my test results.